Harris is one of the most spectacular islands in the dramatic looking chain of Outer Hebrides. There are the requisite rugged peaks and pristine beaches, the lush meadows dotted with wildflowers and then the strange rocky regions with their sheer cliffs and bizarre shapes. Harris is neatly divided into North and South Harris at Tarbet, with North Harris taking the mountains and South Harris the white sandy beaches and the rocky coastline to the east. Our Gurus just love a view and their recommendations for the best places to stay on Harris have got some very impressive vistas. They also love a nice conversion and the best places to stay on Harris certainly haven’t disappointed them on that score either. If you didn’t know of Harris for its spectacularl beauty, you may know it from its tweed. An extremely high quality version of the cloth which is largely still woven by hand in the homes of Harris’ residents. The visitor’s centre in Tarbet has a list of workshops you’re able to visit though, so if you’re at all interested in textiles then that’s an unmissable experience. There are around four hundred islanders employed in this way. Hike up Clisham, which is 799metres above sea level, overlooking the peat moors and the coast. Take a stroll or even a dip at Luskentyre Beach with it's great lengths of white sand and stunning blue water creating a scene that wouldn't look out of place in the Caribbean. Step back in history with a visit to St Clement's Church. It's fascinating from a historical perspective with ancient carvings and tombs inside. There's also great views of the surrounding dramatic scenery. Equally not to miss is the seafood with several restaurants serving wonderful fresh fish dishes. Just remember that if you want to reserve a room in one of the best places to stay in Harris during the busy summer months, you'll have to book well in advance. Alternatively come during the quieter months, when the crowds will have gone, but the scenery will still be spectacular! Scarista House is an old Georgian manse turned charming six bedroom hotel with fabulous views over this dramatic coastline. The rooms are cosy and the food is delicious - especially the seafood. An amazing place to escape the world to. Amhuinnsuidhe Castle is an imposing property overlooking the rugged coastline of the Hebridean Isle of Harris. Rooms are generously proportioned and traditionally styled with antique furniture and chintz fabrics. 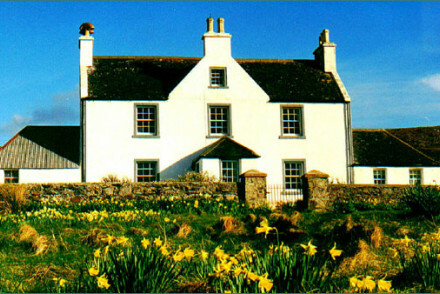 The surrounding estate offers a number of country pursuits from salmon fishing to stalking. If you'd prefer a self-catering option this holiday, don't hesitate to visit our online partner Booking.com for a range of properties ideal for enjoying the remote beauty the island has to offer. Fly to Stornoway Airport located 69km (43 miles) from Harris. The airport serves major cities in Scotland including Edinburgh and Glasgow, along with a connection to Manchester. Alternatively, catch a ferry to Harris with Caledonian MacBrayne Ferries offering links between the islands. Best time to visit - the summer months from June to early September provide the warmest weather for visitors looking to make the most of the outdoors and the beaches. or the 10 best UK island hotels. 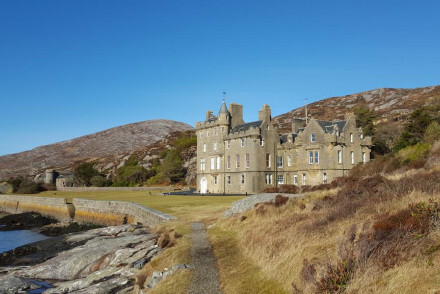 An imposing property overlooking the rugged coastline of the Hebridean Isle of Harris. Rooms are generously proportioned and traditionally styled with antique furniture and chintz fabrics. The surrounding estate offers a number of country pursuits from salmon fishing to stalking. Active Holiday - The surrounding countryside provides a host of rural pursuits. Fishing - Find excellent conditions for salmon and sea trout fishing on the estate itself. Great walks - Spend days exploring the estate and beyond along the miles of walking trails. Birdwatching - Spot golden and white tailed eagles among many other species. Old Georgian manse on the Isle of Harris, now run as a charming hotel. Fabulous views over the stunning coastline. Rooms are cosy and comforting and the food is delicious: the freshest seafood imaginable. Perfect for a romantic escape away from it all.